CEDAR CITY — Charter schools in Utah face a dilemma when it comes to transporting children. On one hand, they aren’t required by law to transport students. Nor do they receive transportation funding from the state like other public schools. However, given the fact that they aren’t as constricted by boundaries as other public schools, they may have students who may want to attend from much farther away. If a school isn’t transporting children, that leaves the responsibility solely up to parents and carpools, an option that can be unattractive — if not outright impossible — for some parents. As a result, many charter schools in Southern Utah are seeking ways to make sure students who want to attend are able to do so. One charter school that recently announced a busing option is Tuacahn High School for the Performing Arts, the oldest charter school in Utah. Vice Principal Ryan Anderson said the transportation issue has been something they have been looking at for several years. Transportation has been identified as the No. 1 reason why students aren’t able to attend the school. This information was gathered via a survey given to students who did attend but who knew people who didn’t attend. Per Utah Code 53A-17a-127, any student who lives beyond a certain distance from his/her school is eligible for state-supported transportation if they are attending a public school other than charter schools. Given Tuacahn’s remote location at the mouth of Padre Canyon, the closest residential area is a small development approximately a mile down the road from the school. Otherwise, most students are traveling from at least the 2 miles that would normally qualify them for state-funded transportation. In the school’s almost 17-year history, several students have even commuted from as far as Cedar City. 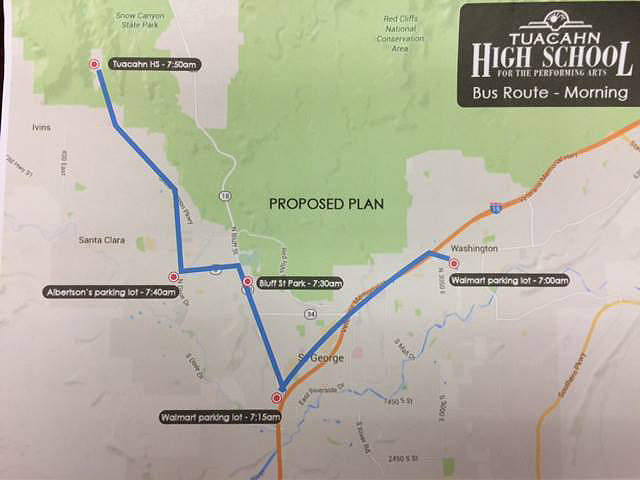 While Tuacahn won’t be able to accommodate students coming from that far, Anderson said the proposed new bus route will extend as far as Washington City. “At this point, we’re (planning on) serving the Washington area, with a pickup at the Washington Wal-Mart,” Anderson said, adding that the Bloomington Wal-Mart and Bluff Street Kmart will be other stops. He said they are considering another stop in St. George, but it hasn’t definitely been decided yet. Since Tuacahn receives no funding from the state for the transportation, Anderson said the school will be subsidizing it using a portion of the school’s weighted pupil unit funding, but users will also participate at a “very economical fee” of $20-$30 per month, at least half of the $60 paid by students using the private transportation company that services Vista School, a charter school in Ivins for grades 1-8. Anderson said they will be using one of their teachers to drive the bus, which the school already owns but which will still be subject to inspections according to state guidelines. This is a sentiment to which Gateway Preparatory Academy Director Andy Burt can relate. Gateway is a Montessori charter school for kindergarten through eighth grade located in Enoch, just north of Cedar City. For the four years previous to the 2015-16 school year, Gateway had been utilizing their own buses to transport students. As far as best practices, procedures, policies and taking care of the kids, the district comes with 60 years of experience … They’re great to work with, and I think they have the best interests of our kids in mind at the forefront at all times. People have a tendency not to think about busing in those terms, but I think they’re really aware of each of our kid’s unique needs and making sure they are safe. When it comes to the question of whether Tuacahn would consider such a collaboration with the Washington County School District, Anderson said they would have to wait and see but that there are some obstacles they would face. Anderson said Tuacahn would be open to considering a “subcontracted relationship” with the district but that he believes it would be difficult for them to add a new route given the difficulties he has heard school districts are having finding drivers for routes they already have.